You started quilting in 2001 and teaching in 2005. What classes did you teach back then? I was visiting one of my local quilt shops and talking to the owner and she asked if I would like to teach a beginners’ class. I designed a simple pieced and appliqué quilt and taught one night a week. You live and work in Adelaide and teach at local shops. Where else have you taught in Australia or overseas? Now the kids are older I have started to travel more with my teaching. I have taught in many rural towns in South Australia and Queensland, and New South Wales and Victoria for retreats, groups and shops. I taught recently at the annual Australasian Quilt Convention for the first time. Do your children have any interest in sewing? All my children can use a sewing machine and have made a number of quilts each. They have all entered and won awards at our South Australian exhibition and my eldest daughter, Briana, has also won at Sydney and National Under 35s competitions for her age group. Now they are all teenagers so they haven’t done a lot of sewing recently, but hopefully they will return to it one day. Tell us a little about your sewing room/studio. I do not have a designated sewing space. I have always worked on our dining table in our family room setting and packing up between meals. While this is not my ideal situation, you work with what you have. I am currently cleaning out two rooms that will become my work space now that our renovations have progressed enough for us to move into our new upstairs areas. 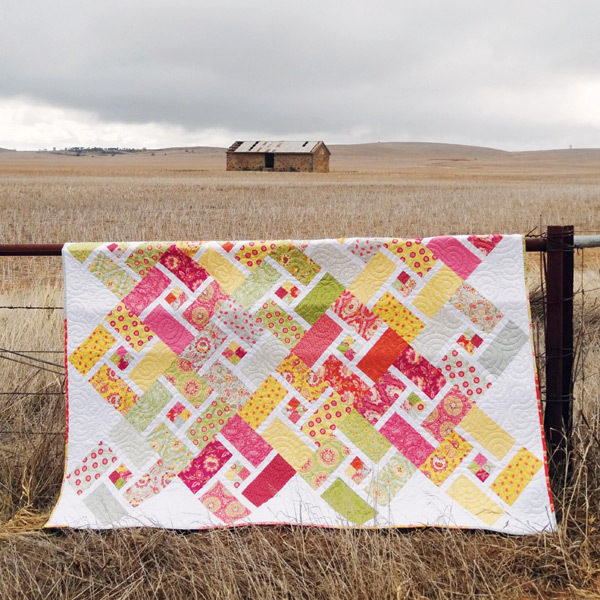 You are best known for your quilting, appliqué and wholecloth, but tell us about the patterns you create using blocks and how you designed a ruler. I love to make quilts to challenge myself and my new block of the month and show quilts are used to do this. I have always designed my own patterns and quilts; even when I was doing my beginners’ class I had three more quilts designed before that class was finished. I started publishing some of my patterns in magazines but have always wanted to have a pattern range of my own. In 2014 I started teaching at a local shop. Each month I designed and made a new quilt featuring a precut with simple piecing. I then produced them as a pattern for retail and also wholesale. I now have more than 20 different pattern designs, almost all of which have come from classes, a lot of them designed as mystery quilt classes. I also have two books which I have self-published. Each one is from my Block of the Month quilt class which I started designing three years ago. I am currently teaching my newest 2018 BOM which had eight different appliquéd Mandala block designs, pieced together with Flying Geese sashings. Each of these quilts is designed to teach multiple techniques so they are great for experienced or confidant beginner quilters. One of my new quilt designs has a specially designed 10-degree ruler that I have made. It is used to trim the pieced blocks to create large pieced wedges which are then joined together. I already have two patterns available to use with this ruler and plan to design at least six more. Do you use any fabrics other than cotton in your quilts? I have used silk a number of times for my show quilts and am currently playing with leather and some velveteen. What is your favourite fabric to quilt on, and what effects can you create? I do love fabric that has a bit of a sheen or interest in the weave. Both of my large wholecloth quilts used a cotton sateen which quilts beautifully. Silk dupion is also wonderful to quilt; it has a lovely body and the sheen gives an added dimension to the quilting. I am really looking forward to exploring more with the leather and velveteen; they both have their own challenges but look extraordinary when quilted, so you will have to wait to see what I do with them. 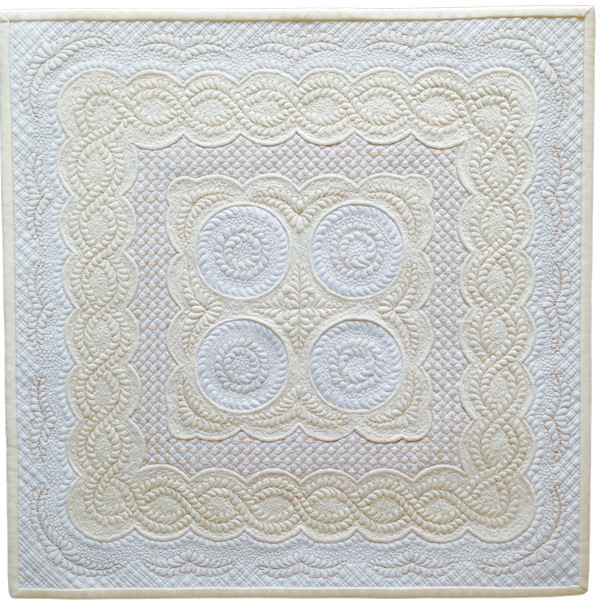 I am also a big fan of shot cotton — I am working on two new show quilts featuring it. What type of quilting designs do you prefer? I love traditional feathers — they are one of my absolute favourites — but I am also having lots of fun exploring more modern designs with lots of lines and simple shapes. I design the quilting to suit whatever it is I am working on, letting the quilt tell me what it needs. Sometimes quilts are very chatty and give me lots of ideas, but other times it’s like trying to talk to a teenage boy — you are lucky to get a grunt or a single word! Approximately how many hours does it take you to complete a quilt? It depends what it’s for. A show quilt can take as many as 500 hours — from the time I start thinking about the design to putting on that label and hanging sleeve. Others, like my pattern quilts, are completed within a few days, although there are always multiple tops waiting to be quilted. Tell us about the quilt that won the Wall Quilts category at AQS QuiltWeek in Paducah of April this year. This quilt has taken me completely by surprise. I made it in 2016 as an entry for the (then) new Modern Quilt category at the Sydney NSW guild members’ show. I had made a small simpler version the year before to enter into the Festival of Quilts in Adelaide, also for the modern section. Up until this point almost all my quilts had been more on the traditional side, even if they were made with bright modern fabrics, but these two quilts were the first ‘modern quilts’ I had created. I drew up the design on my quilt program and then started playing with the colour placement until I was happy with it. But it wasn’t until I had actually pieced it together that I realised how much the colours made the design move and glow. It was a fabulous bonus. I had lots of fun quilting it, changing the thread colours with every fabric change, and this too turned out better than I had imagined. I sent it off for judging and received one of those lovely phone calls telling me I had won a prize. I had planned to attend the show anyway, and it is always great to be there to accept your ribbon. When I first arrived I headed to the quilts to see it hanging — this is usually the first time I actually get to see my new quilts in a vertical position and was thrilled with how it looked. I had so many people coming up and telling me how much they loved the quilt. I was absolutely delighted to be awarded a first in the Modern Category. 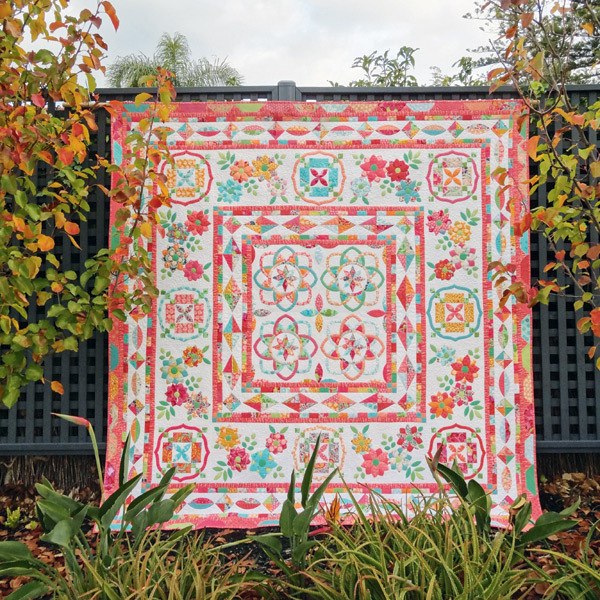 I then entered it into our South Australian Festival of Quilts where it was awarded a first in the Modern Category, and it also won Best of State. This meant it went on to represent SA in the Bernina Best of Australia awards at AQC Melbourne in 2017. 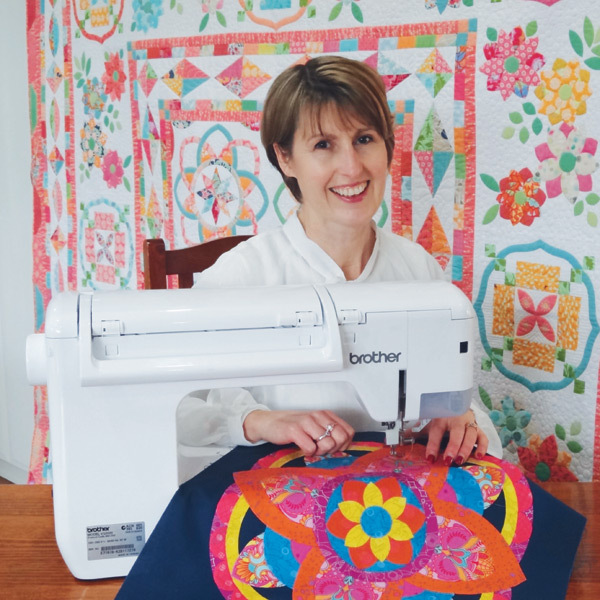 It was a complete shock when it won this award too; I truly had no expectations of this quilt — it was made for fun and to just ‘have a go’ at modern design. Do you only enter one quilt per show? No, I often have more than one in a show. I try to make one ‘show’ quilt each year and also a miniature but I often have other quilts that I have made for classes that I enter as well. It is good to show people that not all your quilts have hundreds of hours spent on them. Do you enter the same quilt in various shows? Yes, I usually enter our South Australian guild members’ exhibition and also the biennial Australian Machine Quilters Festival in Adelaide. I have entered AMQF every year since it started. 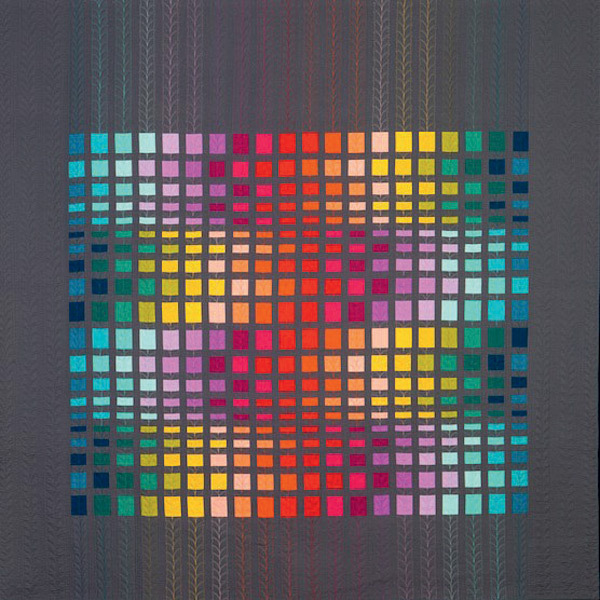 I also enter quilts into the NSW Guild members’ Sydney exhibition most years. I then send my quilts on to a number of shows in the USA, mainly Houston and Paducah, but I have also entered the HMQS and MQX a few times. How many ribbons have you won? Since entering my first judged show in 2005 I have won around 90 ribbons, so that averages around seven a year. How many shows have you entered and won a ribbon? I have entered a lot of different shows and there have been less than six where I wasn’t awarded a ribbon. The first three years I was juried into Houston I didn’t get an award, but every other time since I have won at least an Honourable Mention and I am pretty chuffed to admit I have never had a quilt rejected in any show I have entered. Which is your most awarded quilt? My wholecloth quilt Golden Ivory has won me the most awards, 12 in total, including two Best of Shows and the Best of Australia. In what ways do you grow with each quilt you make for entry? Each quilt I make gives me challenges and lessons, especially my show quilts. I have always designed my show quilts to challenge myself to do the best work I possibly can at the time, whether it’s trying a new technique style or quilting it with designs I haven’t tried before — or fixing things that haven’t gone to plan to make them even better. Entering shows has made me the quilter I am today by setting that challenge to be better than I was yesterday. I love it. Learn turned-edge machine appliqué and free-motion quilting! I currently have a Brother VQ3000. Why do you favour this domestic machine for your award-winning work? I have used Brother machines since 2008 and love their reliability for all aspects of my work. My machine has an excellent straight stitch for all my piecing work, and when I appliqué I stitch with a very tiny zigzag using monofilament thread. This thread is sometimes known for being temperamental, but my machine never skips a beat using it. The most important thing for me is how well it quilts; it has an amazing walking foot which feeds evenly over the most difficult spots. Even when you have lots of seams and when I free-motion quilt, whether I am using the finest silk thread or a heavy-weight variegated, I rarely have an issue. I love the large throat space and it makes quilting even my largest quilts manageable. 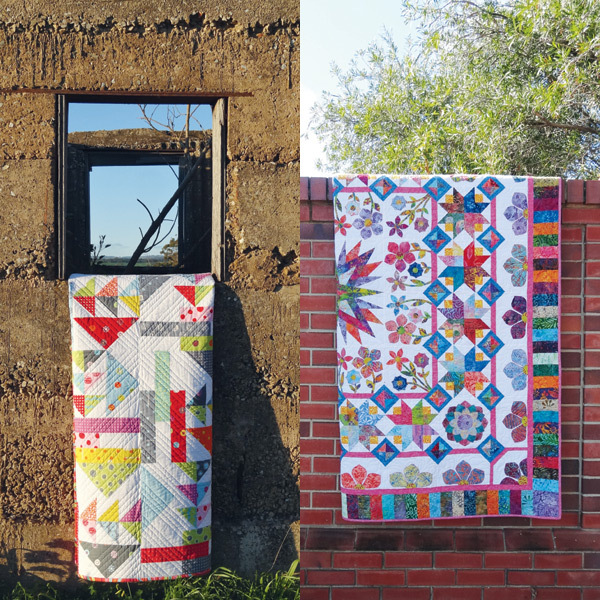 Start small and work your way up to larger quilts. It takes practice and stamina to quilt large quilts. Don’t be too hard on yourself; we all started as beginners — no one started as an expert. Remember the more you quilt, the better you become. It doesn’t happen just by wishing you were better. Find two or three designs you are comfortable with and make quilts with them. Keep adding another design to your collection every project and you will soon have lots of designs you can adapt for anything. When it comes to straight-line quilting using your walking foot, GO SLOW and increase your stitch length (I use a 4). You will get much better results. For free-motion quilting, find your own rhythm; adjust your machine speed to suit your hand movements to get a good stitch length. Use a sample piece to check your tension every time you sit down to quilt; the heat, cold and humidity all have an effect on our threads and machine — what worked yesterday may not today. Learn how to adjust your tension; as I tell my students, you paid good money for your machine so you can play with any buttons you want to. Choose your marking tools wisely. My favourites are blue water-soluble pens, Sewline mechanical lead pencils and Clover charcoal liner pen. If I can’t find a marker to work on a particular fabric I will draw it onto greaseproof paper and stitch the design through the paper. And just putting it out there: I will NEVER use a FRIXON pen on any of my quilts. IMPORTANT NOTE: When using blue soluble markers, always fully rinse your quilts in cold clear water to remove before laundering with detergent. Always test your threads on samples before starting on your quilt. Threads are also a consideration in the final result. I use lots of different threads in my quilts depending on the thickness, colour or sheen I am after. Some of my favourites for quilting are Madeira rayons, Superior Kimono Silk, Magnifico, Bottom Line and Aurifil. The biggest tip I can give you is to have fun quilting your quilts. You don’t have to be perfect to create something beautiful.